Biodiversity Hotspots is a project that so far has run in 36 different schools throughout four county council areas involving over 1,000 children. The aim of the project is to connect students with their local nature by exploring, identifying and mapping local habitats. These maps are presented to the local tidy town or heritage group. The project has been funded by Local Agenda 21 funding administered by local County Councils. In Donegal the Donegal Education Centre aided the coordination of the different schools involved. The project is facilitated by Aengus Kennedy of NatureNorthWest. In 2018 the project will be rolled out in further 5 schools in Donegal, 5 schools in County Wicklow, 6 schools in Dublin City and 2 schools in South County Dublin. This is thanks to the support from Donegal, Wicklow, Dublin City and South County Dublin county councils. Male Emperor Moth found by pupils exploring their Biodiversity Hotspots! Bhreacaigh, Scoil Naisiunta Mhin Teineadh De, Gortnacart National School. Each school had a combination of the older classes, from 3rd to 6th. The Donegal town schools were; 4th, 5th and 6th classes from Glebe National School and 5th class from Scoil Aodh Rua & Nuala. Each day started with a 1.5 hour interactive talk exploring the concepts of biodiversity and eco-services. Once these terms were understood the students drew aerial maps of their local areas from map images presented in a slideshow. The areas were of the immediate surrounding town or townland relevant to the school. Then as a group the students explored their local area, identifying and possible nature rich habitats, or Biodiversity Hotspots. At each hotspot the vegetation structure and the accompanying animal life was investigated. After 2 – 2.5 hours the students returned to the classroom where they worked in pairs to produce an A2 map of the area including the hotspots that they identified. They were accompanied by their teachers, Aengus and a representative from the local tidy town group. When the schools from Donegal had completed the project their was a presentation at the Glebe national school. 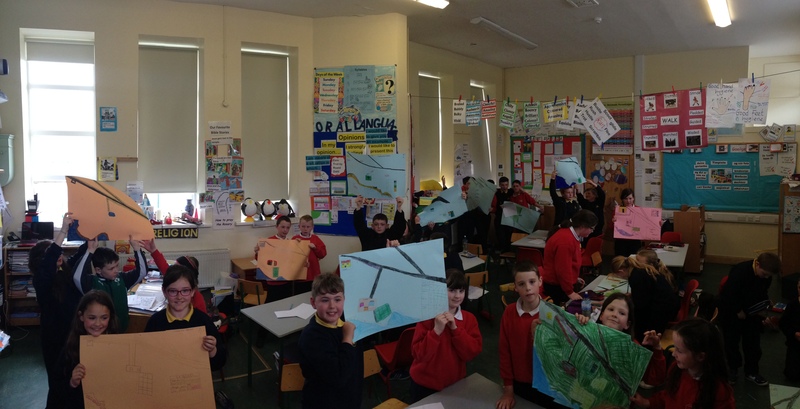 A sample of maps from both schools was presented by students from both schools to the Donegal tidy town group. The mayor of Donegal, the education centre and local media were also present. The presentation was rounded off with refreshments for all. Thank you for a thoroughly enjoyable ‘Biodiversity Day’, we had a memorable day and the kids are inspired by nature and still talking about the day. The teaching of the classroom workshop was inspiring and engaging and very child friendly. Aengus was energetic, dynamic, child-fiendly and humorous and imparted knowledge in a very interesting and fun way. The resources used enhanced the learning and engaged all the pupils. The structure of the day was excellent beginning with the engaging classroom workshop, followed by an excellent and inspiring field trip where we visited local biodiversity hotspots and got learning in an active way, exploring our local environment, the way learning should be! The day linked with our curriculum covering strands and strand units in Geography, Science and History as well as linking to maths and social studies, our school could not recommend this day highly enough! It will live long in the memories of our inspired pupils!!! Our school was recently in the very fortunate position of having Aengus Kennedy deliver one of his hands-on workshops exploring the diversity of habitats in our local school setting. His great knowledge on all topics, and his ability to communicate with pupils of all ages and abilities about biodiversity and nature was both inspiring and highly enjoyable for the children, and everyone learned a vast amount about their own local area over the course of the day. Aengus had an excellent, entertaining, fully integrated approach to the teaching of this aspect of the SESE curriculum, and he held the pupils attentions, and captivated their imaginations with many opportunities of talk and discussion, collaborative learning and brainstorming questioning. After our initial introduction to the concepts of biodiversity, we left the classroom setting and we examined many different habitats, from hedgerows, grassland, stone wall and sea shore. From his preparation, he knew the area very well, and knew the areas that would be of interest. After our field trip, he assisted the children in constructing our own maps of the area, which in itself was a great and highly enjoyable lesson for all concerned. I have received tremendous feedback from parents and children, I thank Aengus for his help, enthusiasm and advice, and we look forward to his return visit to our school next year. I was delighted to be part of and support this innovative and worthwhile project. Children got the opportunity to abandon the desks and technology and explore the beautiful landscape around them. Both the children and the teachers thoroughly enjoyed the experience. The children learned so much about their locality, thus engendering a respect for their environment and local heritage and a realisation of all that is out there just waiting to be explored. Learning through the local landscape and connecting the curriculum to the outdoors provides many opportunities for integration with all areas of the curriculum and when utilised is proven to be a very worthwhile and fruitful methodology. I wish to commend Aengus for acquiring the funding from Agenda 21 to do this work with the schools and his praise was expressed by all concerned for his ability to enthrall the children and make the whole experience so enjoyable. The spirit of partnership displayed by the teachers in the schools in the Ardara area was exemplary as always; ever willing to go the extra mile and they in no small measure ensured the success of the project also.